Jason Gleghorn, assistant professor of biomedical engineering at the University of Delaware, is the first recipient of the new Dr. Bernard Canavan Biomedical Engineering Early Career Faculty Research Award. Gleghorn’s research centers on understanding how cells assemble into functional tissues, using microfluidics and microfabrication for regenerative medicine applications. For example, he is developing lab-on-a-chip devices to investigate how cells interact with each other and their environment in one project and studying how arsenic in groundwater affects fetal lung development in another. This newly established prize, which includes $15,000 of research funds, will be given to one biomedical engineering faculty member at the University of Delaware every other year. A committee selects from a group of nominated faculty based on research achievements, teaching, and service. All nominees must be within the first 10 years of their appointment. 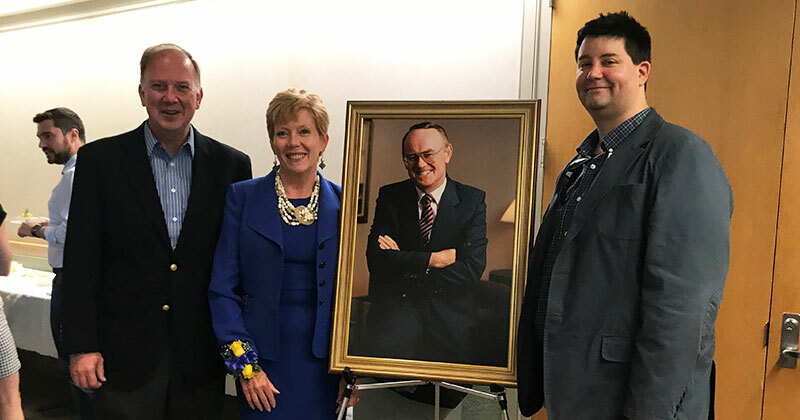 The Dr. Bernard Canavan Faculty Research Award was established in 2018 by his daughter, Helen Stimson, the chair of the biomedical engineering department’s External Advisory Committee, and his wife, Margaret. Stimson is president and CEO of the Delaware BioScience Association. At an award presentation on May 10, Dawn Elliott, chair of UD’s biomedical engineering department, expressed her gratitude for the gift. Stimson said her father was an early enthusiast about biopharmaceutical engineering. Stimson has been impressed by the biomedical engineering department at UD. “You’re such a dedicated group of professors, and everybody is so enthusiastic about their work, I just thought this would be the place he would be,” she said. Bernard Canavan was born in Fife Scotland in 1936 and as the son of a coal miner, he was brought up in a very modest household. He was a very academically gifted person and was the first in his family to go to University. He graduated first in his class from Edinburgh Medical School with an M.B, Ch.B. and a Bachelor of Medicine and Surgery in 1960. Coming from a humble background in a highly class- conscious society, Dr. Canavan elected to immigrate to Canada for his residency and to begin his practice as a Family Doctor, because the opportunities for him were far superior. After practicing for 10 years he decided to join Wyeth Pharmaceutical, a division of American Home Products, as their Canadian Medical Director. He had a very distinguished career, with many global roles and retired in 1994 as the President of the global American Home Product Company. In 1991 he was a key player in the decision to acquire the Genetics Institute, which put American Home’s first focus on the biopharmaceutical market. As a life-long learner, he dug deeply into the science and business of the biopharmaceutical industry recognizing that it would change the complexion of the industry. He retired in 1994 due to health reasons, but remained very active as a Board member on six different early stage biotech startups. One of those companies, BioChem Pharma, was acquired by Shire Pharmaceuticals and Dr. Canavan served as a Board member and Chair of the Audit Committee until his death in 2002.